1. Freshly Picked Moccasins: If you follow me on instagram, you know how much I love these, and I've never even had a baby wear them yet! But I've given them as gifts, and all of my momma friends love them because they are cute, stylish, and actually stay on baby's feet. The quality is beyond. 2. Vonbon: A matching set of leggings, bandana bibs, blankets, and hats in soft prints and sweet shades—what's not to love? 3. Solly Baby: baby wearing is one of my favorite parts of the baby stage, and I've heard so many good things about Solly Baby. I can't wait to put mine to use. 4. Little Hip Squeaks makes cool stuff for cool kids. I love the bold prints paired with the bright colors, and the rompers are my absolute favorite. 5. Baby Jives makes handmade mobiles that are whimsical, modern, and sweet. 6. 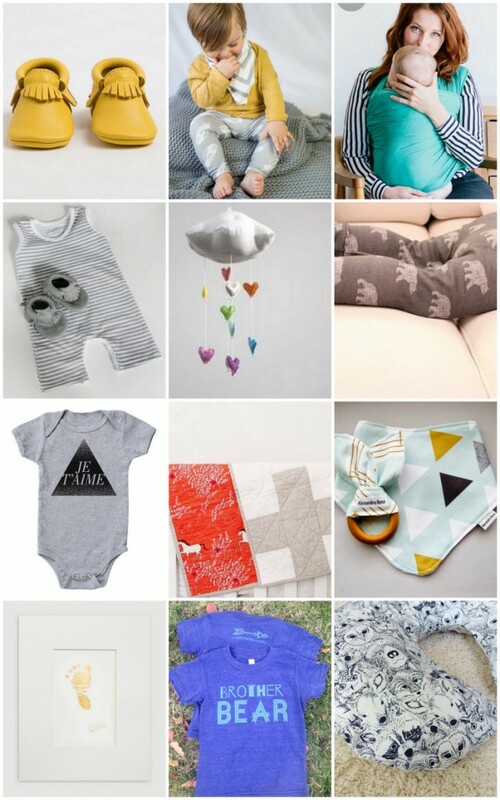 Sugar Plum Lane Baby: The prints in this shop are some of my absolute favorites, and I have lots of items on my own baby wish list, but I especially love the leggings. 7. 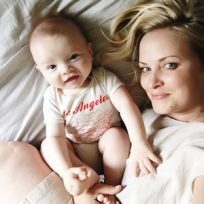 Whistle & Flute: I fell in love with this shop because of their adorable Je T'aime onesie, and they have tees in bigger sizes too, so my boys can match. 8. LWPH Sews: I'd love to have one of these heirloom quilts for baby, and the bold colors and patterns will stimulate baby while keeping them cozy. 9. Shop Alexandra Rose: I'm obsessed with these bibs and modern teethers in bright and colorful patterns. 10. Sosmithy Design: Another heirloom I can't wait to get for baby is one of these gold leaf footprint prints from Sosmithy Design. This is something I'll hang in my home forever, and can pass down to my kids later. 11. Loved by Hannah and Eli: I was won over by the Bear Collection (am needing a "brother bear" tee for both of my boys, but also love the "man cub" and "grumpy bear" tees! ), but this shop has so many cute items for baby, kid, and momma too. 12. Lil Slumber Co: Mix and match your crib sheet, changing cover, Boppy cover, and more for your nursery—the available fabrics are fun, modern, bright, and bold. I hope I've introduced you to some baby items and shops you didn't know about yet—I always love discovering fun new things for baby. I also love that these are all from smaller companies, most started by fellow mommas (or parents) and inspired by their own children. What are some of your favorite things for baby?